No one has the time to print out let alone read the use-case document, AKA use-case book. The wireframes are too detailed to follow for those who don't live and breath them. The PRD is really just a cut&paste from a previous PRD. What can you do? 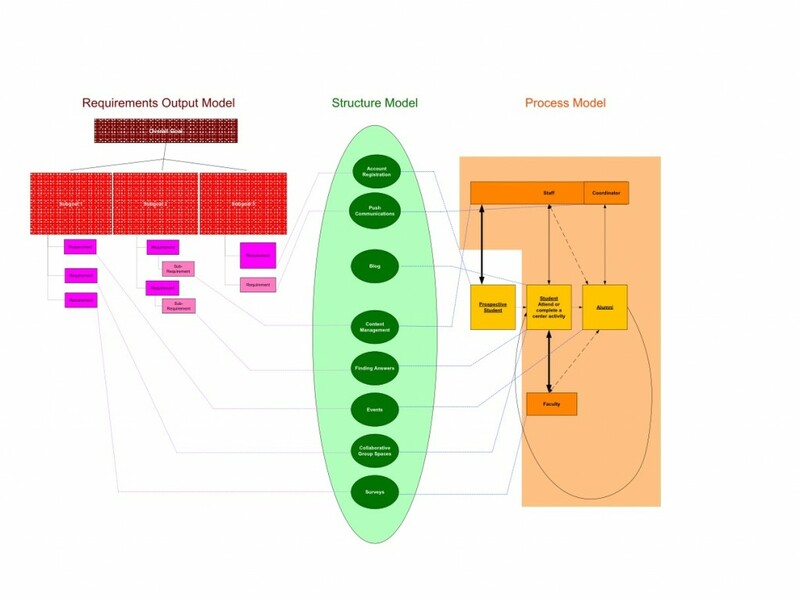 Take a look at the Function-Structure-Process Diagram. The goal of this diagram is to do five things. Show a clear understanding of the goals (function) of the business or organization. Show a clear understanding of the process (activities) for the users and how they change over time. Change over time could involve learning something (as in this example), building brand awareness or loyalty, or conquest of new customers. Show the overall structure of the solution you are proposing which could be a web presence or web application. Show which specific parts of the structure you are proposing support which processes (activities) that the users are engaged in. Yes, this is systems thinking with plurality. This entry was posted on 02/09/2009 (Wednesday) at 11:11 pm and is filed under experience design, rendering, Uncategorized. You can follow any responses to this entry through the RSS 2.0 feed. You can leave a response, or trackback from your own site. R755 theme designed by varometro. 38 queries in 0.735 seconds.